Why do we throw away so much perfectly good food? 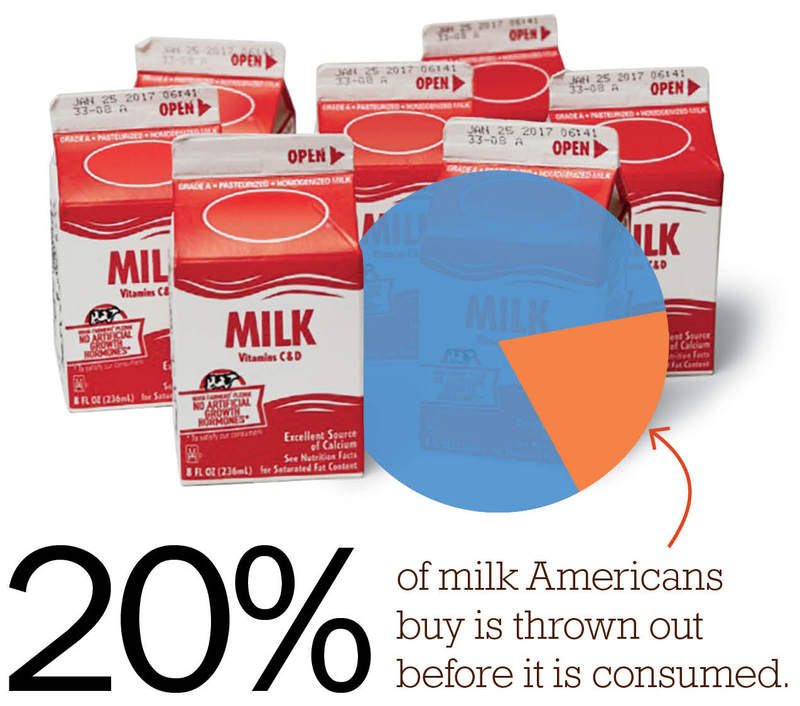 The findings imply that the way foods are packaged can enable waste. Tweaking package sizes may keep consumers from buying more than they’ll eat. 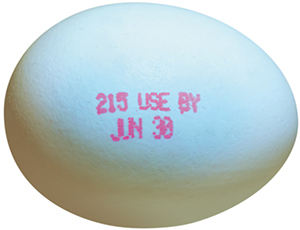 But one wide-reaching change would be to standardize date labels—currently unregulated at the federal level—so that they have a consistent meaning. “To move forward on [reducing] food waste,” Wilson said, “we will need collaborations between industry, consumer groups and the government to change labels.” —C.L. Sometimes your eyes are bigger than your stomach. PLANNING. 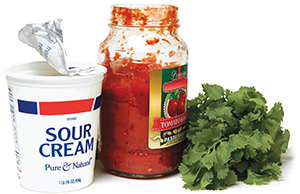 For recipes that call for apples or tomatoes, Tufts Dining buys imperfect “seconds” that might otherwise get tossed, and had a local company create a custom marinara sauce that can use imperfect tomatoes. They also started ordering smaller bananas after noticing that a lot of half-eaten bananas were being left on breakfast plates. EDUCATING. In February, Tufts Dining held its second Waste Less dinner in Dewick-McPhie dining center, with information stations where diners learned about waste and sustainability. The highlight is the weighing station, where student volunteers weigh the food diners leave on their plates, to raise awareness. COMPOSTING. 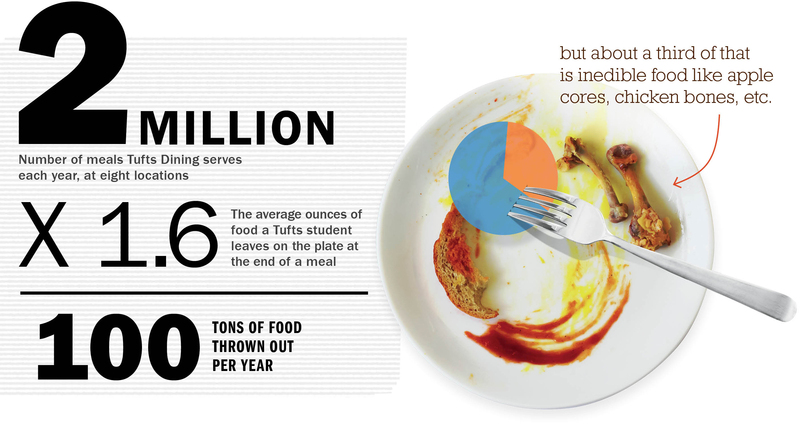 360 tons were composted in 2014-15 by Tufts Dining, including napkins and other non-food items. 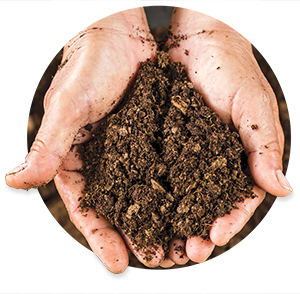 Tufts has been composting for more than 15 years. DONATING. 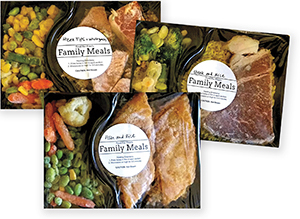 In March 2016, The Tufts Food Rescue Collaborative (formed by faculty, staff and students) started turning leftover dining center food into meals for the hungry. Student volunteers use a food-packaging machine to assemble and refrigerate meals that Food for Free, a local nonprofit, delivers to people in need. 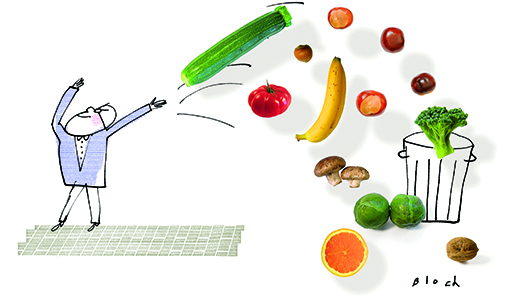 New technologies could extend the shelf life of produce. How quickly do avocados go from unripe to mushy and spoiled? A funny internet meme out there goes like this: Avocado—Not yet. Not yet. Not yet. Too late. 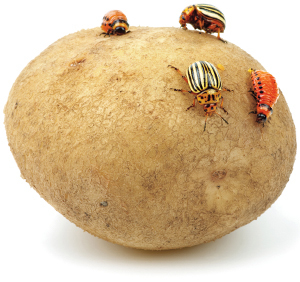 Of course, avocados aren’t the only produce that always seem to go bad before we’ve gotten around to eating them. Fuzzy strawberries, darkened bananas and decaying tomatoes that act as fruit-fly bait can be just as frustrating. But solutions may be on the way in the form of two promising technologies with Tufts roots that could extend the shelf life of fragile produce. Tufts biomedical engineer Fiorenzo Omenetto sees potential in a surprising place: silk. More specifically, in the silk fibroin, an insoluble protein found in silk that can help prevent decay in fruits by controlling their permeability to gases. Meanwhile, Irwin Heller, A67, A98P, a founder of BioWish Technologies, has been working on extending the shelf life of bananas. His product began as a wash to remove the sticky, discoloring latex sap that oozes from bunches when they are harvested. The wash, made from dietary fiber and active microbial cultures that break down the sap, is an environmentally friendly alternative to traditional banana-washing techniques, which use chlorine, aluminum sulfate and lots of fresh water. But the fiber wash has an even bigger benefit. Bananas cleaned with it stay green far longer than bananas washed the traditional way, making them more likely to reach consumers before they overripen. “Loss” means food that doesn’t make it to market, while “waste” is the term for food that stores, restaurants and consumers toss. Loss is a greater concern in developing countries, accounting for 84 to 95 percent of the food that goes uneaten there. Waste is a bigger problem in higher-income countries, where about a third of uneaten food is simply squandered. Researchers see chances to fight both problems all along the supply chain. Harvests lost to poor storage and contamination. Farmers in low-income countries often can’t protect harvested crops from the elements and pests. Simple technologies, such as metal silos, could help. Some farmers cut their losses by 40 percent when they started using specialized plastic storage bags. Food lost in packaging and handling. Without refrigeration or other ways to preserve them, foods wilt and spoil. Rough handling damages produce and hurries rot. Food wasted by stores and restau­rants. America stores toss about 43 billion pounds of food per year—from dented melons to discontinued cookies to ham that is nearing its “sell by” date. Restaurants cook abundant amounts and then dump what’s left at the end of the day. Food wasted at home. What with buying too much, serving too much and not storing food properly, an average American family throws away up to $2,200 worth of food every year. Discarded cartons in schools show there’s room to improve. The meals served in our nation’s public schools may vary from region to region, but there’s one thing they have in common: the small carton of chilled milk that’s offered to every child at every meal of the week. Rich in vitamin A, calcium, vitamin D and magnesium, milk is valued for its unique nutritional profile. 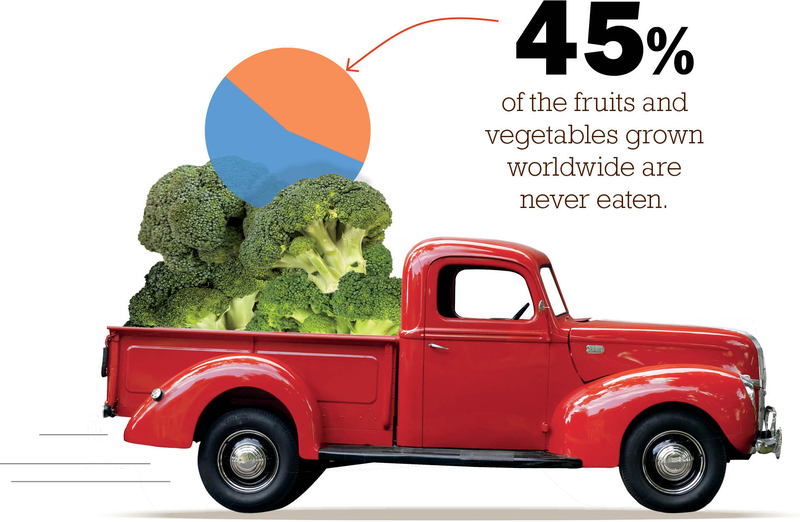 But it turns out many of those nutrients meant for kids’ bellies are going down the drain. Stacy Blondin, a doctoral candidate in food policy and applied nutrition at the Friedman School, set out to measure milk waste in the School Breakfast Program, a federally assisted program that has grown exponentially in the past decade as a way to give all children access to healthy food. Blondin looked at 20 classrooms in a medium-sized, urban school district in the Northeast. The classrooms used a Breakfast in the Classroom model, in which students were served food right at their desks. Researchers collected what went uneaten of the children’s meals and weighed the leftover milk. They discovered that in this case, the well-intentioned system, not the consumer, was the more concerning source of waste. While the children who took milk did a pretty good job of drinking it, consuming about 74 percent of it, a considerable number of cartons brought to the classrooms were untouched. Even if they remained unopened, food safety regulations do not allow them to be served again because of milk’s susceptibility to spoilage. Altogether, about 45 percent of the milk brought to the classrooms was thrown away. Blondin estimated that this rate of milk waste amounted to an annual loss of almost $275,000 in this school district alone—16 percent of the district’s breakfast program expenditures. Environmental costs were hefty, too. “Milk has a higher resource intensity in terms of production than plant-based foods,” Blondin said. Making that much milk would require more than 192 million liters of water and more than 495,000 kilograms of carbon dioxide equivalents over the course of a school year. Multiply that by every school district in the country, and suddenly that tiny carton looms much larger in its importance. The results of the Tufts study, published in the American Journal of Public Health, led Blondin to suggest better calibrating milk supply and demand in the classroom and finding ways to preserve milk once it reaches the classroom, perhaps by refrigeration or shelf-stable packaging. Schools could also consider adding other foods that contain some of milk’s nutrients to their menus to make up for the milk that kids aren’t drinking. Such steps, she said, could help keep school breakfast programs economically and environmentally sustainable, while keeping kids well-nourished in the years to come. —C.L. Studies find no more health risks from genetically engineered crops than from conventional ones, but we cannot abandon other plant-breeding methods. An inconvenient truth about old sewer systems. Scout troops strive for healthier habits. 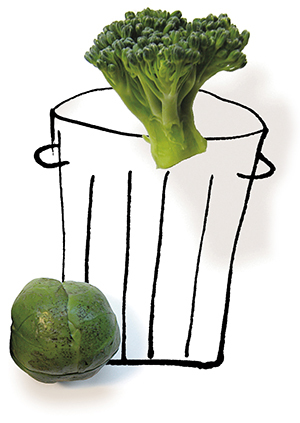 We offer some tips on how you can fight food waste. Gimme an R! Gimme a D! Mom, There’s Something Green on My Plate!